Remember: hearing is thought to be the last sense to go in the dying process, so never assume the person is unable to hear you. Talk as if they can hear you, even if they appear to be unconscious or restless. If possible, lower lighting until it is soft, or light candles, making sure they burn in a safe place. Try to keep bright sunlight away from the dying person’s face and eyes. You might wish to quietly read a favourite poem, a spiritual passage or a religious text that means something special to the person. Strong physical contact can be painful or invasive. It is often best just to sit beside the bed and gently hold their hand. If appropriate, a gentle massage to the feet or hands can provide comfort and help communication on a deeper level. Even when a person is unconscious or semi-conscious, they might be able to respond with faint pressure from their thumb, or twitch a toe. Remember: it is impossible to predict when death will actually happen. People can hover between life and death for hours and often days, and it is easy to miss the final moment. There are certain physical signs which indicate the person is close to death. Yawning: even when unconscious or semi-conscious, the person may often yawn. This is a natural response to draw more oxygen into the body. Coldness in the limbs: sometimes the person’s hands, arms, feet and legs become cold, with the skin tone changing as blood circulation slows down. However, this many not happen until right at the end. Tea-coloured urine: the lack of fluid intake coupled with the kidneys beginning to shut down means the person’s urine will become concentrated. It may also have a pungent smell, or cease altogether. Incontinence: as the muscles of the body cease to function, there may be a loss of bladder and bowel control. This can be very upsetting and embarrassing for the person. With patients who are unconscious, nursing staff will insert a catheter. Agitation and restlessness: dying people who are confused or semi-conscious can become quite distressed. They may also cry out. Sometimes in their confusion, they may try and remove medical interventions such as canulas or other tubes into their body. Nursing staff will often give medication such as morphine to calm them down. Smell: the shutting down of the dying person’s system and the changes of the metabolism from the breath and skin and body fluids create a distinctive acetone odour that is similar to the smell of nail polish remover. If a person is dying from bowl or stomach cancer, the smell can sometimes be pungent and unpleasant. Be aware that this will happen, and that it may at first be uncomfortable for you. No longer responding: the person can no longer speak even when awake, and will take rasping breaths through an open mouth. This can sound like loud snoring which can be disconcerting to listen to. It also makes their mouth dry. You can help to ease this by gently wiping their mouth and lips with a damp cloth. Breathing pattern change: the person can alternate between loud rasping breaths to quiet breathing. Towards the end, dying people will often breathe only periodically, with an intake of breath followed by no breath for several seconds, and then a further intake. This is known as Cheyne-Stokes breathing. This can be upsetting to witness as the person seems to have ceased breathing only to start again. Death rattle: there may also be a rattling noise (often referred to as the “death rattle”) at the back of the throat. The person is no longer able to cough or swallow, which causes secretions such as saliva to pool in the back of the throat. When death happens, it happens very quickly. There is no doubt about what is taking place. Sometimes the person will give several outward pants as their heart and lungs stop. Others may give a long out-breath followed quite a few seconds later by what seems another intake of breath. This may be repeated for several minutes, which can be alarming if you are not ready for it. However, this is only the lungs expelling air. Skin tone alters and the facial expression changes, or loosens. You may not feel you recognise the person anymore. Some people look remarkably at peace. There’s a sense of no-one being ‘home’. The moment of death can happen in many ways. It can be an intensely spiritual experience. Alternatively, it may feel rather prosaic. The essence of the person has gone, leaving behind a body that can seem like an empty envelope. You may feel grief. You may feel numb. You may feel relief. It may feel like an anti-climax – especially in a hospital or institution where nursing staff may be coming in and out to deal with necessary practicalities. There is no ‘right’ or ‘wrong’ way to feel. If it’s what you want, staff may also leave you alone for a while with the body. This can be both reassuring and sometimes unexpectedly peaceful. 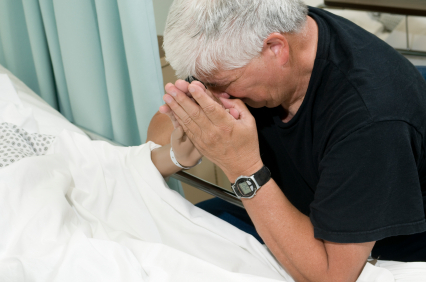 Sometimes those present at the deathbed report less immediately physical experiences. Carers and relatives may talk of seeing vapours leaving or hovering over the body. Others have described loving light filling the room or a sudden change in room temperature. Or there may be a heaviness in the air which takes time to clear, or there may be other strange phenomena such as clocks stopping at the moment of death, pets behaving out of character, or birds and butterflies appearing at the window. Relatives and friends who were not there may experience ‘seeing’ or sensing the dead person and knowing the exact time of death before they are officially informed. These ‘visitations’ are usually comforting and reassuring, and very memorable. It’s not unusual after someone has died, especially when you were present at the time, to feel disconnected from people, places or things. It can feel as if you are in a dream, or looking at life through frosted glass. This can be especially difficult when you are thrown into the intensity of making funeral arrangements. It can be hard to explain how you are feeling, especially to those who have never witnessed a death. But feeling strange or disconnected from reality for a period of time is understandable when we have watched someone die. You may also feel that you are being forced to face your own mortality, or you may feel you don’t know what to do with yourself. You can find yourself aimlessly wandering around, feeling lost and alone and deeply questioning everything in your life.. However you experience what happens, life will never be the same again. It can’t be after something so profound. Over the following weeks and months, for some there may be emotional and spiritual rawness that throws up feelings of anger as well as grief. For others, it can be truly liberating. We only really know what we need to deal with as we go through our grieving process. Make sure you find the right support for yourself.